What a fitting name Edwin Starr had. A "Star" for his luminous singing future at Motown and elsewhere. An extra "r" for the emphatic growl from his throat. It wasn't the only time Charles Edwin Hatcher arose with a new identity. His first birth took place in Nashville, Tennessee on January 21, 1942. He became a Cleveland, Ohio native not long after. In 1956, high schooler Hatcher unveiled his latest creation, a doo-wop group called the Future Tones. The vocalists took the talent contest circuit by storm, and took the time to record one song. Upon his return two years later, the draftee tried to but couldn't resuscitate his Future Tones. So in 1963, he became the newest singer with the Bill Doggett Combo. It was that group's manager who suggested that Hatcher the standout become a "Starr." The success of "Stop Her on Sight (S.O.S.)" demonstrated his staying power the next year. And when Motown scooped up Ric Tic in 1968, Starr joined his friends the Funk Brothers at the pop-soul giant. Tricky negotiations kept Edwin's star down low for a while. He declared "I Am the Man for You Baby" that year, but he really hit the big time with "Twenty-Five Miles" in 1969. While that song penetrated both Top 10s, "I'm Still a Struggling Man" didn't. 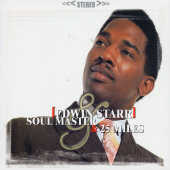 Its title would characterize Edwin Starr's Motown status as a soul-stirring but less sellable singer than his colleagues. Though some Edwin Starr music included the man's own stamp, he flew into the constellations with a Barrett Strong and Norman Whitfield song slated for the Temptations. When the time came to issue the single, the company balked, and Starr walked away with "War." It tore up the charts and fired up a generation as one of the clearest and harshest social indictments ever recorded. So much for Motown going the safe route! After the follow-up, "Stop the War Now," the Edwin Starr discography included "Funky Music Sho' Nuff Turns Me On" and the 1974 soundtrack, Hell Up in Harlem. How fitting that the initially intended scorer for that movie had been Starr's inspiration, James Brown. Motown, meanwhile, didn't try too hard to market Starr as soul royalty. After 1975, he moved on to other companies, releasing Free to Be Myself and Afternoon Sunshine along the way. His turn at the 20th Century label marked another self-revival through disco. With "Contact" and "H.A.P.P.Y. Radio" in the late '70s, he shook up bodies as much as he had souls. A new decade, a new home across the Atlantic. In quieter moments, Starr enjoyed relaxing with his two dogs or with classic movies. But his stronger, more lasting U.K. support gave him further opportunities to record, perform live, and otherwise connect with the public into the millennium. At the same time, some of his work celebrated his Motown ties: A tribute to Marvin Gaye, a three-year stint at the Motorcity label, and shows with the Four Tops and Temptations, or Martha Reeves and Mary Wilson. Old hits like "Funky Music Sho' Nuff Turns Me On" and "Twenty-Five Miles" got new spins by dance-oriented groups and featured Starr cameos. Then, one day, at home in Nottingham, England, Motown's most ferocious of singers suffered a fatal heart attack. The date was April 2, 2003. He was 61. Perhaps Edwin Starr merely left his body to become one last thing: pure soul. Got to keep on rockin' to Motown oldies after this Edwin Starr biography? Choose other artists to read about from the homepage.